COLORADO SPRINGS – SpaceX sent the Arabsat-6A communications satellite into geosynchronous transfer orbit April 11, completing the Falcon Heavy rocket’s first commercial launch. 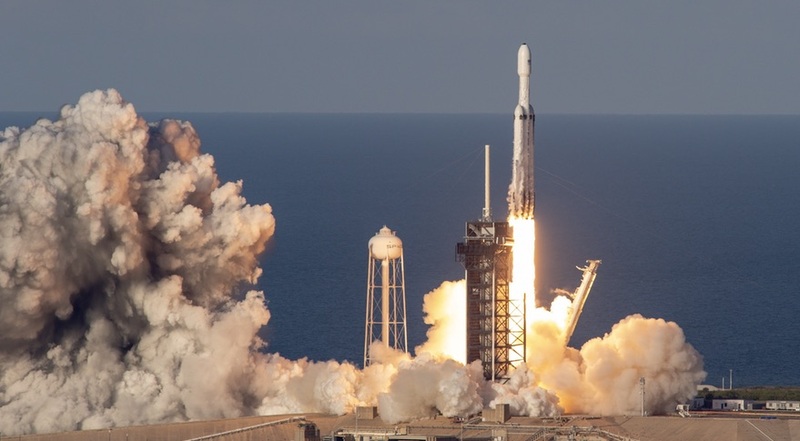 The Falcon Heavy, using Block 5 boosters, lifted off at 6:35 p.m. Eastern from Launch Complex 39A at the Kennedy Space Center in Florida and released the 6,460-kilogram Arabsat-6A into a transfer orbit approximately 34 minutes later. For the first time, SpaceX succeeded in landing all three Falcon Heavy boosters. The two side boosters touched down about eight minutes after liftoff on Landing Zones 1 and 2 at the former Launch Complex 13 at Cape Canaveral. The center core landed on a SpaceX drone ship ten minutes and 20 seconds into the mission. After the 2018 Falcon Heavy launch, the side boosters returned to the landing pads but the center core missed the drone ship when only one of three engines ignited for the final landing burn. Saudi Arabia-based Arabsat announced plans to launch with SpaceX in spring 2015, but at the time hadn’t decided between the Falcon 9 or Falcon Heavy. The company selected Falcon Heavy in September 2015 for a mission anticipated in late 2017 or 2018. In an interview, Khalid Balkheyour, Arabsat’s chief executive, said Arabsat chose the Falcon Heavy in order to extend the lifespan of the Arabsat-6A satellite beyond the 15 years a geostationary communications satellite is typically designed to last. “We needed more lifetime for the satellite, so we had the option: Falcon 9 or Falcon Heavy, and we decided to go with Falcon Heavy,” Balkheyour said. Preliminary calculations show the satellite will get an extra boost from Falcon Heavy that should extend its life to between 18 and 20 years, he added.